NATURAL LAUNDRY PRETREATMENT - Do you have funky smelling laundry? Stinky athletic gear? Ammonia problems in your cloth diapers that make your eyes water? You need Funk Rock Ammonia Bouncer! ADD TO PRE-WASH CYCLE - Just add 1 tbsp of Funk Rock and use the pre-wash cycle in your washing machine to eliminate stinky build-up and keep it from coming back. Awesome cloth diaper detergent pre-wash or for pretreating sportswear and other extra icky items before tossing them all in the regular cycle. USE AS A DEEP CLEANING SOAK - Sometimes intense cleaning is needed, and we know it. 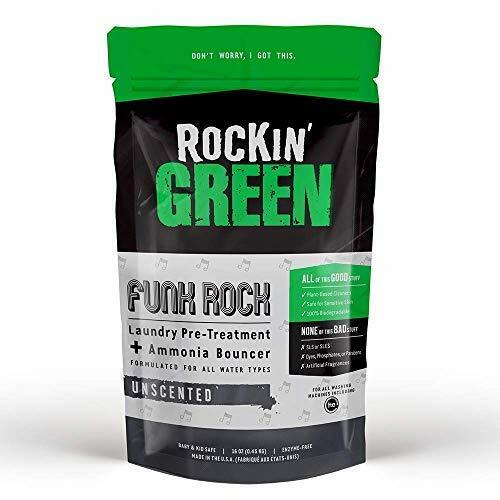 For a deeper clean, use a couple of tablespoons of Funk Rock Ammonia Bouncer powder in water to soak your stinkiest of stinky things. 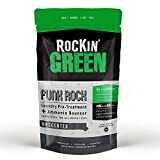 NON-TOXIC FOR NO FUNK - Rockin' Green Funk Rock is a plant-based, natural laundry pre-treatment with NO phosphates, parabens, optical brighteners, SLS/SLES, or artificial fragrances. Non-toxic, vegan, and totally biodegradable. JOIN THE ROCKIN' FAMILY - We can all do our part to make the Earth a better place... we do ours by rockin' the clean so YOU can rock the green!